This section (5 kilometers, 1.5 hours) includes two Tarahumara settlements named Nacayvo on the official Mexican map (INEGI) of the area. 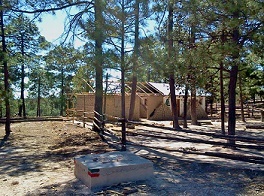 Separated by approximately 5 kilometers on Highway 77, the northern and southern ranchos provide a glimpse of rural Tarahumara life in the Sierra: a few simple houses, stony fields, surrounded by the pine forest. In 2016 the southern rancho (at Kilometer 37 on Highway 77) is cut through entirely by the new natural gas pipeline from the Pacific Coast to Chihuahua. This section starts at the Nacayvo bus shelter on Highway 77. 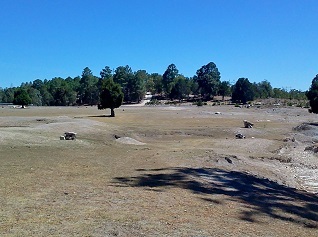 Nacayvo is a small rural Tarahumara community of roughly 10 families living in houses scattered around a large flat “meadow” area on both sides of a water course. Highway 77 circles the meadow to the South and joins the railroad at the southern end of the meadow. 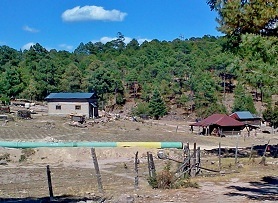 Several farm houses and buildings are on top of the mesa near the bus stop, including a small health facility only 50 meters west of the bus shelter with an easy-to-read sign “Casa de Salud” (“House of Health”). The Camino begins by turning west toward the Casa de Salud located among the trees on the top of the bluff above the meadow area. 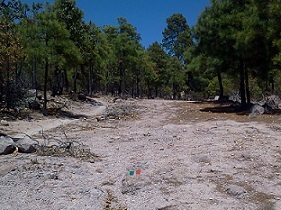 It passes the Casa, turns sharply to the left, and descends the bluff (20 meters) through trees toward the meadow area. The meadow is largely treeless and features large fields on both sides of a shallow water course. Due to the scarcity of trees and rocks, there are only a few trail markers in the meadow itself – only several on isolated rocks and fence posts. Nonetheless, hikers should be able to follow the Camino by traveling toward the highway (south) and the trees visible on the opposite side (west). The Camino is the middle of the fields, heading south (toward the highway). 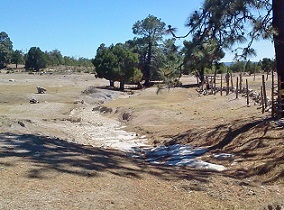 After 200 meters in the meadow, the trail crosses the water course to follow a fence line west toward the pine forest on the western edge of the open area. There are several house scattered among the trees. Behind the trees is the railroad. After reaching the trees, the Camino meets a small country road from the Tarahumara houses. It turns a hard left and travels parallel to the railroad for 100 meters. At this point (700 meters from the start) the Camino has reached the southwest corner of the Nacayvo meadow. 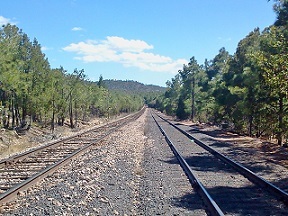 At this southwest corner of the Nacayvo meadow the Camino makes a sharp turn to the right (more than 90 degrees) and crosses the railroad in 10 meters. After the crossing the Camino bends slightly left and ascends following a rough country road toward the West. At this point the railroad and highway are slightly more distant on the left (roughly 100 meters). The wide pipeline service road bends left (among a network of alternative roads) and remains close to both the railroad and the highway. 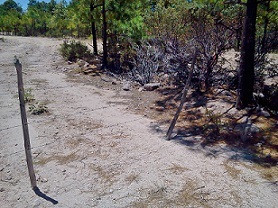 The pipeline service road is wide, rocky and rough in parts, but generally straight in a due south direction (as are the highway and the railroad) for roughly 1.5 kilometers. There are no trees close to the road, and as a result the route is not shaded. The green and red Camino trail markers are nearly 100% on rocks in the road or on the side. At 2.0 kilometers from the bus stop, the Camino bends left onto a pleasant, tree-lined side road parallel to the wide service road. After 100 meters the trail passes through a barbed wire gate and immediately rejoins the service road. In another 200 meters, at 2.3 kilometers from the start, the Camino bends right off the wide road onto a smaller forest road that is lined with trees. This section descends sharply over a length of approximately 100 meters, where it makes a sharp left turn onto another country road that runs parallel to a barbed wire fence on the left. There are many roads and paths in this area. Hikers must take care to follow the green and red Camino markers. This road continues for 300 meters through the trees before coming to another barbed wire fence. It can easily be seen that the Tarahumara who use the trail simply cross the fence without a gate. Camino hikers should also be able cross either over or under the fence according to their preference. After the fence crossing the trail consists of alternating sections of gently rolling forest path and country road for another 1.5 kilometers. The trail is tree-lined and offers pleasant easy hiking. To the left (roughly 50 meters) is the railroad. Further to the left (another 50 meters) is the highway. In this substantially flat section the railroad is “double tracked,” where a train station and train yard existed in the past and where even now trains traveling in one direction can “lay by” to permit those traveling in the opposite direction to pass. 4.4. kilometers from the Nacayvo shelter, the Camino comes to a “gate” in a fence that blocks the trail. However, immediately the right of the gate, there is an opening in the barbed wire fence. Hikers can easily pass through this opening and continue straight. In approximately 300 meters the Camino descends slightly (10 meters) into a final wide water course before rising again to an intersection with yet another country road providing access to Tarahumara ranchos to the West. The trail makes a hard left turn onto the access road. In just 5 meters it crosses the railroad (which has previously been to the left (east)). In another 20 meters the Camino reaches Highway 77. Immediately below the crossing point on 77 (east side), a few Tarahumara buildings (Nacayvo Sur) can be seen below the highway level, as well as the route of the new gas pipeline. The Section 10 ends at this point 5.0 kms from the Nacayvo Norte bus stop.